Winter Harvest delivery from Farm to CityYou know that giddy feeling when, long after birthday or holiday celebrations are over, one more package comes in the mail? Or someone gives you a magazine subscription, and you keep getting little bonus presents all year long? That's what it's like to give (or receive) the gift of a CSA share. And while CSAs traditionally refer to shares of locally-grown produce, there is a whole new batch of CSAs that offer more than fruits and veggies. Local dairy treats would be a knockout present for the discerning foodie in your life. With 13 pick-ups of gorgeous goat cheese between May and December, chevre is the name of the game in Yellow Springs Farms’ cheese CSA. Little Baby’s Ice Cream doles out two or four pints a month of “provocative” vegan or dairy-based flavors in their Deep Winter Community Supported Ice Cream Share. A cow-, pig- or lamb-share would make a locavore carnivore’s year. 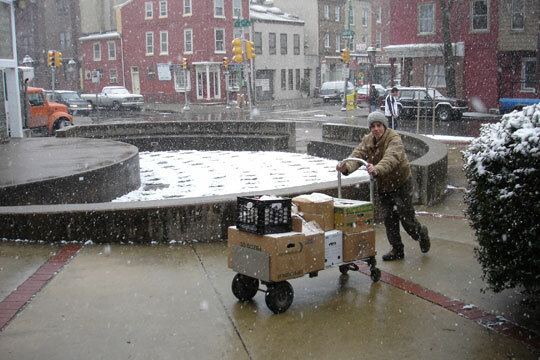 Philly Cow Share sends cuts of local, grass-fed, dry-aged beef to customers; Erdenheim Farm offers whole and half Cheviot lamb shares; and Lancaster Farm Fresh Cooperative extends a limited number of shares of humanely raised, pastured pigs. Herbal tonics, salves, teas and oils are available from the Lancaster Farm Fresh Community Medicine Share, the Philadelphia Folklore Project is rolling out a Community Supported Art project, featuring original works from local folk artists, and see the accompanying article about The Head and the Hand's book share. Of course, more traditional produce-centric CSAs continue well past the fall harvest. Greensgrow Farms’ Winter CSA keeps it interesting with a combination of root vegetables, greens, local dairy and meat and vegan items. This year, they’ve got optional cheese and coffee add-ons, too. While it's not a CSA, participants in Farm to City’s Winter Harvest buying club can order vegetables from family farms and honey, poultry, herbs, preserves, baked goods, and other stuff that keeps seasonal cooking and eating exciting. Find more CSAs in this years Local Food Guide. This story is from page 30 of our Countdown to the Holidays feature in our December 2013 issue.